Oops - we don't appear to have a video for the ScanFront 300. Bought scanner on recommendation of a work colleague. Although the scanner is very fast, from the beginning we had problems with the feeder, which kept on taking many pages at once. Quite frustrating as we decided on a expensive scanner exactly because quite often we need to scan long documents and feeding one page at a time really defeats the purpose. Waiting for the rollers and a circuit to be replaced. Hope that will solve the problem but I’m afraid that I wouldn’t recommend it. 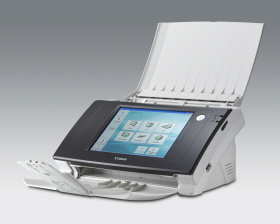 We have actually purchased 4-5 of these scanners now as they worked so well in our work place. Compact and so easy to use and overall a good product.